We make choices all day everyday. We hope those choices we made are the best one's for us. Today I had the choices of going to my girlfriend's house and sleeping in with her, or take an hour long train ride to school. It was quite difficult to decide which one I would enjoy more, then I came to the conclusion that I would rather enjoy going to see my girlfriend than go to school. But then I put more thought into my decision and questioned myself "which choice is better for me?". With that question in mind it was evident that my decision would be to go to school. Whenever I have to make a decision for myself I put a lot of thought into the outcome of either choice I make. If I am still indecisive and I am able to, I ask someone who's opinion I trust to help me decide with their in put, whether it be family or friend. Robert Frost's "The Road Not Taken" is a poem that tells a tale of a traveler that had the opportunity of choosing which road to travel on. The woods were the color yellow where the road split in two. One of the roads bent into an undergrowth making the roads unequal. One was well trodden while the other road was grassy and wanted wear. The traveler wouldn't come back to travel the other road because he knew one way would lead to many other ways. He will be telling the story ages hence with a sigh. The tone is this poem is dull and mysterious. The traveler took the road less traveled on and that made all the difference. His decision is important because following the wrong road could lead him into a dead end. The poem says the decision was risky and could be rewarding. "Dead End" by Rudolfo Anaya is a story inspired by a Mexican legend of "La Llorona". The legend influenced the story by naming the main character after the women in the legend, by actually mentioning the legend at the end of the story, and by teaching a life lesson stating that life is a struggle and you have to take care of yourself. The setting is important because it takes place in a modern time at California, which gives a more realistic feel of the struggles the story portrays. The main characters are: Maria, her mother, her father, her brother, her sister, dennise, ana, sandra, frankie, and sue yonomoto. Maria's mother has the most influence to her due to maria's promise to her mother saying she will stay in school and become someone. The conflicts in the story are, being true to yourself, fitting in with the crowd, staying above the influence, and human temptations. Maria's promise to her mother has shaped her whole life from how she thinks to how she acts. Lonely plays a factor in choice making because it creates empathy and desire. Empathy for another person's loneliness and desire to end that feeling of being all alone in a crowd. Envy and empathy impact choice making. Envy creates jealousy of another persons happiness and success, thus making you want to be like that person. Empathy creates pity and pity makes a person want to help that person see the brighter side of life. The symbol of this story is staying true to your promises and staying focused on your goals. In "The Tyranny of Choice" its provides data on how choices affect happiness. Research shows that the more choices the more unhappy people are. People are happy to have a choice but too many decreases happiness. Most people are not happy with the decisions they make. I am a maximizer because after doing the chart I revealed that its hard to make a decision that keeps me satisfied. Regret can make me not repeat the same choice I made to feel that way. It can lessen my options knowing that I will regret that choice if it's made. It means I chose to have something that I'm "okay" with, that I'm not completely satisfied but I'm willing to make due with it. Yes people generally have high expectations because I believe that choice is what we really need. The effect of our high expectations only creates dissapointment when my decision turns out to be different from my expectation. This cartoon shows choice by illustrating how the people follow trends and choose to shop at the same store as every other person to fit in with the rest. Choices are a part of everyones daily life. If we are satisfied with the choices made depends on the individual. In all the stories its shows how the characters are for the moment satisfied with their choice but as the results of their choice unfolds they realize it's not what they wanted. The choices I make in life do not satisfy me, for I feel I could always do better and thus I strive to satisfy that feeling. Satire is a literary genre that uses sarcasm in an exposing or denouncing way with the intent of shaming individuals, and society itself into improvement. Satire is meant to be funny, and uses wit as a weapon. A common feature of satire is strong irony, ridicule, and sarcasm. Satire is found in many artistic forms of expression, such as literature, plays, commentary, and media such as lyrics. In Taylor Mali's "The impotence of proofreading" he explains the importance of proofreading with satire. Spellchecker is being satirized and the author does it by using irony and sarcasm throughout the article to further explain the importance of proofreading. It's satire because "But there are several missed aches that a spell chukker can¹t can¹t catch catch." this is satire because it's proving a point about spellchecking while being sarcastic and ironic by misspelling and using wrong punctuation. "Has this ever happened to you? You work very hard on a paper for English class And then get a very low grade (like a D or even a D-) and all because you are the word's worst speller. Proofreading your papers is a matter of the the utmost importence." Reading this shows me that satire can be funny and be full of irony and sarcasm. This article shows how it can be used at its best and how it delivers its message so clearly. In the Onion an article "Bags of Ice" is speaking of a party that is themed and decorated with bags of ice. Describes a Hollywood event planner that had no time or motivation to create a glamorous birthday party. The whole event was decorated with bags of ice everywhere and columns of ice spread out. The pool even had bags of ice floating around. It's satirical because this Hollywood event planner is pictured to be the one of the greats, but puts no effort in this event and still has a success. The event was followed by an after party themed "bags of water" at the same location. In "Advice to Youth" by Mark Twain, he tries to teach the youth valuable life lessons. Mark Twain teaches about, obeying parents, being respectful to your elders, going to bed early to get up early, the art of lying, never handle firearms carelessly, and to know what good books are. In Twain's opinion obeying is the best policy because if you don't obey your parents, they will make you obey them and most parents think they know best, but it is best to act on their judgement than your own. Twain tells the youth to restrain from using violence, but if they are wronged and do not know if it was intentional or a mistake then wait for a chance and hit him with a brick. If you shall find that it wasn't intentional then come out and confess in your wrong and face it like a man. Always avoid violence, its the age of charity and kindness. Leave the dynamite to the low and unrefined. In "The Storyteller" by H.H. Munro he tells a satirical story about a family and a scholar. The story takes place in a train where a family of an Aunt, 2 girls, and a boy are in a carriage talking. The scholar sits and watches as the children ask their aunt questions about things that they see and end up hearing a story from their aunt. The children don't like the aunts story, so the scholar tells a story that the children love about a little good that has 3 awards for being extra good and gets the chance to go to the Prince's park. While at the park the little girl gets eaten by a wolf, while hiding in a bush, and gets discovered due to the clinging of her medals. The Aunt calls the story improper and says he undermined years of careful teaching. The satirical part of this story is that children will be asking the aunt for and improper story instead of her boring stories. An article on Newshoggers illustrates how a london janitor was mistaken for a top Al- Qaeda member. He was on the internet looking at a website, reading a joke called how to build an H bomb. He was taken to many prisons to be tortured repeatedly and finally ended up in Gitmo. The satirical part of this article is that he was accused of being a terrorist for reading a joke on how to build an H bomb, mean while its on the internet for the whole world to see! 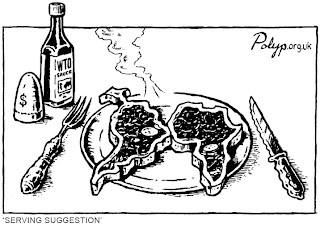 This cartoon is satirical because the two pieces of steak are shaped to appear like South America and Africa. This cartoon illustrates that the two countries are on a silver platter helplessly awaiting to be served for better or worse. The salt represents money which can be added to the country steaks if needed. The sauce is labeled WTO which stands for World Trade Organization. What makes this cartoon satirical is that these countries need money to reduce poverty and become more prosperous, they could only do that with the WTO. With satire being used in many types of work, it can be found worldwide you just have to know how to find it. Satire is a literary genre that uses sarcasm in an exposing or denouncing way with the intent of shaming individuals, and society itself into improvement. In all the examples used it is noticeable that satire is meant to be funny, and uses wit as a weapon. Irony is using words that are the opposite of what your describing to have an emphatic or humorous effect. To me Irony is the funniest form of comedy. To others Irony could be annoying or demeaning, but none the less Irony is everywhere. Irony is on our TV when the commercials are on. It is on our computer whenever we search a website or that website has popup ads. Irony is on billboards, on the back of the box of cereal. Irony is on every form of advertisement due to the fact that it sells products and gets results. It helps figure out what the public likes and dislikes. With Irony being a form of expression, it can be used in mutliple ways on the public for any age range. To give further detail on Irony the poem "Richard Cory" by Edwin Arlington Robinson can shed some light. Richard Cory was a man, a very rich man. "He was a gentleman from sole to crown, the townspeople admired his appearance and enjoyed his mannerisms." The people wished to be in his place. Richard was a man who seemed to have everything he could ever want, until one summer night he put a bullet through his head. This poem was ironic because it depicted a man who had everything, wealth, power, education, and admiration. "Whenever Richard Cory went down town, We people on the pavement looked at him: He was a gentleman from sole to crown, Clean favored, and imperially slim." The people admired him for his kindness and wished they were him instead of living in poverty. "In fine, we thought he was everything To make us wish that we were in his place." The man who appeared to have everything killed himself. "And Richard Cory, one calm summer night, Went home and put a bullet through his head." Its ironic because he seemed so happy with everything he had and made people envy his success, but overall he was not happy, and decided to end his misery. "The Most Dangerous Game" by Richard Connel illustrates irony in a visual and dramatic fashion. Richard Connel weaves the story with detail and emotions that allows the reader to visualize the setting of the story. In the story, the main character Rainsford is a big-game hunter who loves the sport. The irony in the story is Rainsford does not care about the feelings of the animals he hunts and just says that they have no understanding, and feels its a sign of weakness to care for them. "You're a big-game hunter, not a philosopher. Who cares how a jaguar feels?". "Be a realist. The world is made up of two classes--the hunters and the huntees. Luckily, you and I are hunters". Rainsford continues to have the same point of view until he is placed in a situation where he is being hunted for sport by General Zaroff. Rainsford sees the inhumanity of the sport when he is the sport. "Did not make me condone cold-blooded murder". "Hunting? Great Guns, General Zaroff, what you speak of is murder." Another ironic moment in the story is when Rainsford turns the tables on Zaroff and wins the game. "You have won the game." Rainsford did not smile. "I am still a beast at bay," he said, in a low, hoarse voice. "Get ready, General Zaroff." The general made one of his deepest bows. "I see," he said. "Splendid! One of us is to furnish a repast for the hounds. The other will sleep in this very excellent bed. On guard, Rainsford." . . He had never slept in a better bed, Rainsford decided." This is Ironic because Zaroff was a master hunter and was ultimately defeated by his prey. In "The House That Slaves Built" by Gardiner Harris the irony is written with more of a historical background. The article gives a little background information about the White House on who did the labor in constructing it. Blacks were the main work force when slavery was still legal in 1801, they built the White House from top to bottom. The irony of the article is that blacks were prohibited from entering the White House even though they built it. This continued until President Lincoln invited Fredrick Douglass to the White House in the 19th century to celebrate the President's second inaugural. After 200 hundred years Barack Obama moves in with his family and represents a strong symbol of change for Americans of all races. It's ironic because the Whites would keep the Blacks out of the White House, which they built and were prohibited from entering at all times. Now a Black American family calls the White House thier home and ended the White House's reputation of "White Only". "Is it ironic that so many don't understand irony" is an article that defines and explains irony and its many forms. There are 5 types of Irony, Socratic Irony, Dramatic Irony, Tragic Irony, Verbal Irony, and Situational Irony. The article itself comments on the fact that people don't know the definition of Irony and don't know how it is used correctly. The article defines Irony as "a pretense of ignorance and of willingness to learn from another assumed in order to make the other's false conceptions conspicuous by adroit questioning". It gives an example of Irony which is "that someone steps into a puddle and you make fun of them… and the next thing you know, you step in one!?". This is Ironic because a person is being made fun of for stepping into a puddle, then that person who is laughing steps into a puddle as well. Another way to get a better understanding of Irony is going to isitironic.com. This site gives more examples of Irony such as "...if you have a phobia of longs words you have to tell people that you have Hippopotomonstrosesquipedaliophobia?...". This is Ironic because the person has a fear of long words and in order to tell people of said fear, the person has to say a long word. This cartoon is ironic because the man is afraid of spiders, but turns out to be spiderman himself! This is a humorous kind of Irony. Alanis Morissette made a song called "Ironic". It depicts how Irony can affect you in differents ways. This song is Ironic because the title is "Irony" but Alanis doesn't know how to use Irony correctly. The song mostly depicts coincidences not Irony. On line 6 "It's like rain on your wedding day". That is not Irony, it is a coincidence that it rained on a wedding day. On line 25 "A traffic jam when you're already late". It is only a coincidence that there is a traffic jam when your already late. In this video about sociaL networking, a family depicts an ironic message. The message is that older people are becoming less social. The daughter explains how she wants her parents to join Facebook to become more sociable. She thinks she is "living" because she has 687 friends and her parents aren't "living" because they only have 19 friends. Mean while she is home on her laptop alone, and her parents are outside with friends having a good time. Irony comes in many forms and be used in different ways. It is using words that are the opposite of what your describing to have an emphatic or humorous effect. All the Irony described here are just its many forms and effects it has on people. Irony is a part of my life whenever I see an advertisement or a television program. It sometimes makes me want to buy a product or watch more of the same show. A metaphor is used to help us understand the unknown. We use things that we already know in comparison to the unknown to get a better understanding. An example of a metaphor is "Space is the ocean, vast and unexplored". This is a metaphor because it is describing the unknown with something more known. There are many kinds of metaphors, theres a simile, personification, anthropomorphism, hyperbole, parable, fable, and analogy. A simile is often used as a metaphor, comparing two unlike things to get a better understanding. An example of a simile is "John eats like a pig". It is a simile because it is comparing a person to how an animal eats to describe his eating habits to a pig. Personification is another form of metaphor being used to give objects or animals human qualities in order to give them a more better understanding. An example of personification is "The sun peeked happily from behind a cloud". It is a personification because the sun was given a human characteristic to describe its radiance. Another way to use a metaphor is anthropomorphism, it uses human forms or qualities to an entity that is not human. Specifically it describes Gods or Goddesses in human form and possessing human characteristics such as, love, hatred, or jealousy. An example of anthropomorphism is "Zues was a jealous god". This is anthropomorphism because it has given a thing that is not human, in this case a God, the human quality of jealousy. A hyperbole is used as an exaggeration or overstatement, such as "I'm so hungry I could eat a horse". This is a hyperbole because it uses an exaggeration to describe one's hunger. A parable is a succinct story, in prose or verse, which illustrates one or more lessons of self improvement using human characters. An example of a parable is "after Jim's and Sarah's long perilous journey, they learned how to trust and the true worth of companionship". This is a parable because it shows what the human characters went through to learn an important lesson in life. Another example of a metaphor is a fable. Although similar to a parable, a fable uses non human characters such as animals, mythical creatures, plants, inanimate objects, or forces of nature which are anthropomorphized to illustrate a moral lesson. An example of a fable is the "Hare and the Tortoise", the animals were used to illustrate that slow and steady wins the race. This an example of a fable because the animals are used to teach that it is better to approach life at a slow and steady pace instead of running ahead of yourself. Analogy is another form of a metaphor. This is the comparision of two pairs which have the same relationship. The key is to ascertain the relationship between the first so you can choose the correct second pair. An analogy is "Living is to dying as birth is to death". This is an analogy because it compares living to dying which is in the same relationship of the life cycle, as to comparing death to birth which is also in the same relationship in the life cycle. Looking at poetry is a good way to understand metaphors. In the poem "Peace" the type of metaphor being used is Personification. In lines 1-3 "The wind is now a roaring, smashing monster of destruction". The wind is being described as a roaring, smashing monster of destruction, to give a better understanding of how powerful and destructive it is. It was given the quality of a smashing monster to better describe the damage it did on the area. In the poem "Joy" the type of metaphor being used is Personification. In lines 6-9 "Amidst the frozen white, a tiny tip of green, first blade of grass, the messenger of spring". The grass is being described as a blade that cut threw the frozen snow, it was a sign that winter was coming to an end and spring was approaching. In "The Gastronomic Gym" the type of metaphor being used is personification. In lines 1-5 "Pasta twirling and spinning, peas do vertical jumps mashed potatoes swimming. Meat doing bench press and pumps. Food has begun to exercise". The food are given the ability to do physical exercise to describe the process of being digested. In "The Lion in Love" the type of metaphor being used is a Fable. In this fable the lesson that is being taught is, "Love can tame the wildest". The lion is being used to represent the king of the beast, or the wildest in nature. He falls in love with a young beautiful maiden and asks her parents for her hand in marriage. The parents deny him at first adding that he has to relinquish his dangerous claws and teeth. The lion was so madly in love he trimmed his claws and took out his teeth without hesitation. The lion's actions for his love defines "Love can tame the wildest". Emily Dickinson was a poet born on, December 10, 1830. She didn't achieve fame until after she died on, May 15, 1886. In her poem "I took my power in my hand" in lines 7-8 she uses the metaphor "Was it Goliath was too large, Or only I too small". This metaphor explains that she does not know what stopped her from conquering her problem (Goliath), was it that her problem was to big for her to handle by herself, or was it that she was too small to approach the problem. In her poem "Success is counted sweetest" in lines 1-4 shes uses the metaphor "Success is counted sweetest By those who ne'er succeed. To comprehend a nectar Requires sorest need". In this metaphor success is being compared to sweetness. It explains how having success can be the sweetest thing to a person that never succeeded. It says in order to comprehend the value of success it has to be needed desperately. E e cummings is a poet that made a poem differently from most standard forms. His creation is called "l(a" these are all letters and punctuation. It differs from most poems because it is presented in a manner to visualize a falling leaf. It is a metaphor because it is comparing loneliness to a leaf that is falling from a tree. The leaf was once part of a whole, but became separated, and was by itself all alone. If presented in a normal manner it would appear like this "loneliness (a leaf falls)". Metaphors are a part of your daily life in ways you wouldn't recognize. Metaphors are in music, TV shows, and even in our daily conversations! The way metaphors could be applied is limitless! Metaphors could be used as a guideline to life, could be used as a motivation to achieve greatness, and even be used to help others in need of advice. A metaphor I apply to my life is "A Mountain Climb - Life consists of hierarchies. We are always climbing the corporate ladder". It symbolizes that I am constantly on the way to greater and better things. Technology has made a new form of linear writing called Hypertext. When written on paper, text is linear. Digital text is different. Digital is more flexible, it can be virtually anywhere. With technology growing digital text will change all forms of writing. It can even change the way we learn information. In the video I watched it says we are the web, the people control what is being uploaded worldwide. With writing evolving we are able to create sources of information and show it to the entire globe. By using HTML we can create programs to publish all kinds of info by video, text, or sound. The people can create Blog sites that the individual himself can have complete freedom to upload whatever his heart desires. By using HTML we can constantly change the content on his site whenever he wants. Digital text can do better. Form and content can be separated. XML was designed just for that. Title does not define the form. It defines the content and virtually all other elements in the document. So the data can be exported, free of formatting constraints. With form and content separated, users don't need to know complicated codes to upload content to the web. With XML it facilitates automated data exchange, two sites can "mash" data together. A perfect example of this is Flickr Maps. I am able to see the world without actually exploring it, or know where I am going when planning my next vacation in another country. Who will organize all this data? We will. I will. With this in mind we have to rethink some things. We have to rethink copyright, with newer and more sophisticated technology being created daily people need to get the respect for their accomplishments. Rethinking authorship by knowing that as technology gets more advanced fewer people will take this occupation solely due to the fact that books will now be read on paper, but on screens. Rethink identity in a way that technology will change the way we read by replacing papers with a screen, or reading the newspaper will change to learning the information on my iphone. Rethink ethics by changing the way we learn information from written text on paper, to learning everything from digital text on a computer. Rethink aesthetics by appreciating the beauty of technology and how it can take different shapes and deliver what we need from it. Rethink rhetoric by influential speeches being delivered in completely different ways and possibly to an even larger audience than ever before. Rethink governance in a way that with technology the government can be able to have more of hold on the people through multiple ways, or be able to reach people in danger in a more quicker and effective manner. Rethink privacy in a way that with the worldwide web anything uploaded will be seen throughout the world to all kinds of audiences. Rethink commerce in a way that with technology having an increase in demand every time something newer and better is created, we have to find better and faster ways to deliver the products in a broader scale so everyone can enjoy. In the article I read educators are trying to change the way we educate the youth. With ideas of using leading 21st-century learning methods and tools, while combining it with the best of traditional classroom learning. Educators argue that this new and improved way of learning can’t be established due to the fact that today’s school system has rigid schedules, inflexible facilities, and fixed boundaries between grades. If we are to use the new 21st-century education, then we have to change the schools physical appearance by creating more flexible learning spaces that can be rearranged to fit different class sizes and subjects, to even changing the units of time than the typical 50-minute class period. In order to give myself a better understanding on how technology has grown over the years, I decided to interview my grandpa who is 60 years old. I asked him how he had to rethink the way he gets things done, and how he had to learn with the more advanced technology. I brought up the topic Banking and the first thing he told me was "it got easier". I learned that compared to today's banks, making transactions was a big hassle. Everything major had to be done in check, no credit card, no online site. He had to physically go to the bank and handle the paper work there. Today's banks transactions could be as easy as visiting the website. I asked about how the government changed, he said "the government is a lot stricter". With technology so simple compared to today's, the government wasn't able to "check' on the people's daily web use. The government wasn't able to be more involved with the public's interest as to compared to now, the government is able to view anybodies web history. I asked about business and he responded "it's never been better". Despite today's economy he made clear points on how business grew. Businesses weren't able to reach a broader range of consumers compared to today. With the help of today's technology, businesses across the globe are able to promote their product and successfully sell their product. Their are more advertisements in TV, radio, web, and on the streets thanks to the advancement in technology. In the video it shows how primitive technology was. It shows how mostly everything was rethought. From workout machines to bikes, from TV's to cameras. Everything has changed to a more advanced and sohpisticated form. An exapmle of how technology was rethought is how video games changed from being a simple black and white pixel "pong" game, to changing into a complex interactional colored picture video. With the advancements made in technology it is possible to listen to your favorite songs where ever you go instead of being home playing your song on a record player.